I am writing this post in order to make good on an earlier promise to write about an inverter installation in our 5th wheel. I am doing so despite the fact we have since installed a second inverter: reason being, each inverter was installed in a different manner and for somewhat different purposes. I am placing this page under the Solar Power menu of the blog because for me and many others inverters go hand-in-hand with solar power and because I really don’t have a DIY or modifications section on the blog. In my previous RV I only had 110 volt household current when I was plugged into shore power at a campground, when I ran my disturbingly noisy generator, or when I turned on my inverter to power the single, dedicated outlet I had installed with it. 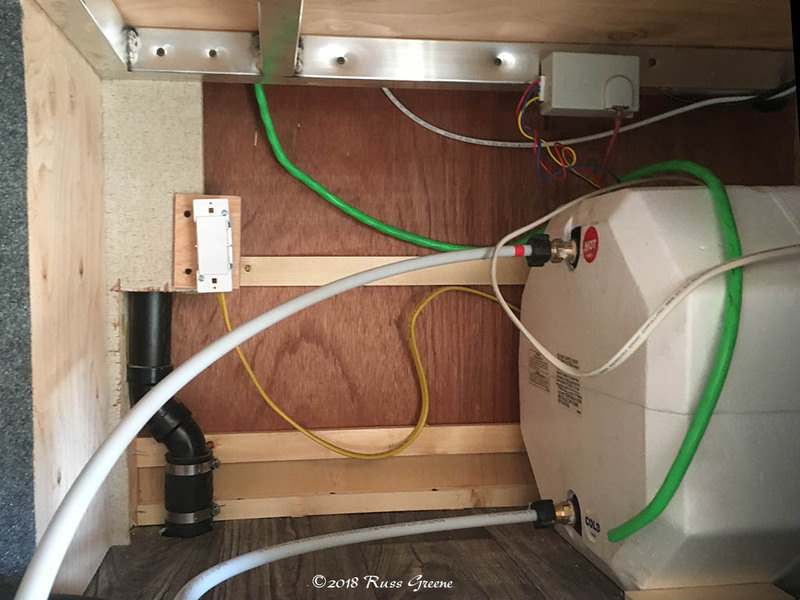 This last method involved running extension cords from that outlet to other points inside (or outside) the RV where I wanted or needed household current–inconvenient and a tripping hazard. When I started looking at all that was involved in wiring an inverter into the RV’s electrical system it soon became apparent to me that it was outside my wheelhouse of skills. So, I decided to have that done professionally, but until I could hire it done I was comfortable doing a more simple trip-over-the-extension-cord temporary style hookup that would at least provide us with some AC until the professional installation could be performed. Before I explain how I performed the installation it might be good to first expand a little on the two inverters we now have. One is a 1000 watt inverter. This one, an Aims 1000 watt pure sine wave inverter, was intended to serve us temporarily until we could have a larger inverter, a 2800 watt Magnum MS 2812 installed. The Aims would be sufficient to power most anything we wanted to with the exception of the microwave, electric heaters and of course air-conditioning. The Magnum has the oomph required to power the microwave but we can only do so for short bursts because of the huge amount of battery reserve power required to do so. The Magnum also contains a battery charger which the Aims does not. Both inverters are pure sine wave inverters which are preferable to modified sine wave inverters for running sensitive electronics. A discussion of pure vs. modified sine wave inverters is beyond the scope of this post, as is the discussion of high frequency vs. low frequency inverters. For now I’ll just say that the Aims inverter cost somewhere near $200 making it suitable for a temporary solution and the Magnum much closer to $1,500. Each has so far served us well. 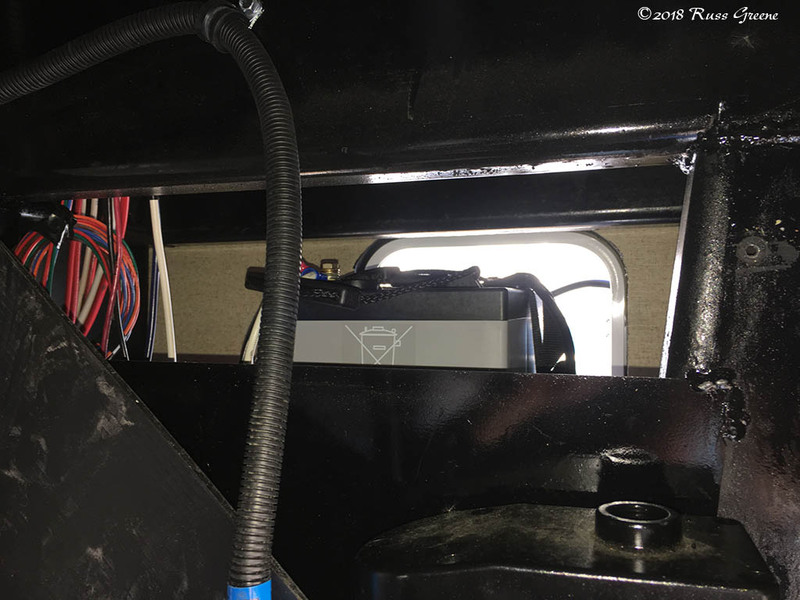 This shot shows the Aims inverter mounted inside the front storage compartment on the driver side of my fifth wheel RV. It also shows the Blue Sea On/Off switch with the positive battery cable going over the steel divider that separates the storage compartment from the battery compartment. Later, the plastic piece that separates the compartments would be reinstalled and the wires mounted with insulated P-clips so that they would not rest on the metal edge of the steel divider. 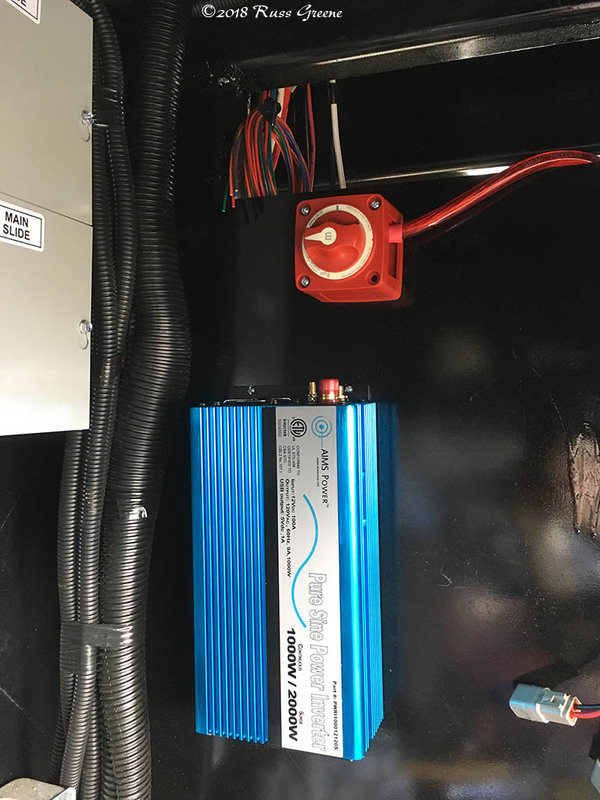 I decided to mount the Aims inverter in the front storage compartment of the RV because there was room and because it would be close to the batteries while being in a separate compartment. The latter two points are important considerations. Keeping anything that can create sparks separate from anything that can ignite is a good idea unless it is your intention to create a fire or an explosion. Inverters can create sparks and batteries can create hydrogen gas which is explosive so it’s best to keep them separated. We have AGM batteries which create little if any hydrogen gas not likely to be of concern but even so… Also, in order to minimize voltage drop it is important to mount inverters as close to the batteries as possible and to use electrical cables of sufficient gauge. Looking for a passageway to use for routing the AC wires from the inverter I pulled an outlet out of the wall behind the TV and fed a piece of green wired into it to see if I could find a pathway to the pass-through storage compartment below. Once the mounting location for the inverter had been puzzled out I needed to find a spot for the dedicated 110 volt AC outlet. 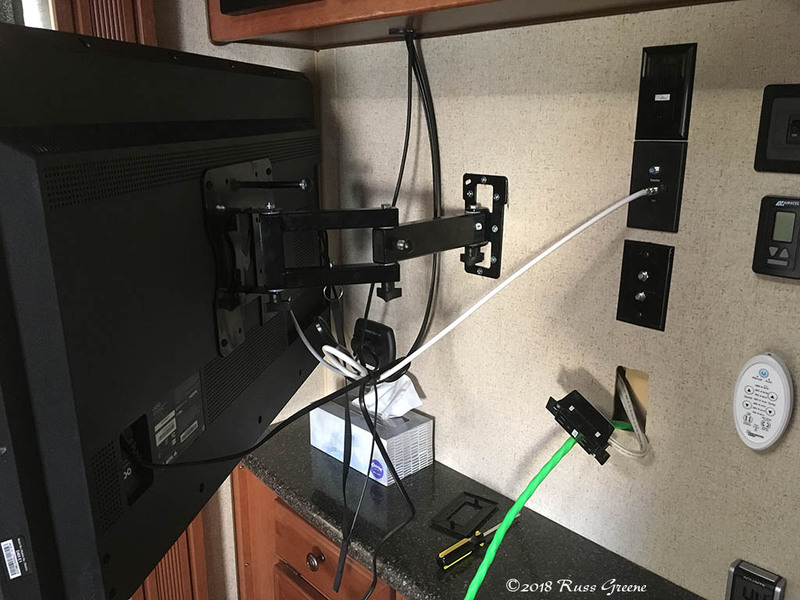 As it turned out, there was a spot behind the TV that was central to the RV and to which it would be quite easy to route the wires coming from the inverter. Finding a route for wires can be a challenge in an RV and it took some doing but I did find one. It went from the front storage compartment through a pre-existing hole in the forward bulkhead, along the rafters of the basement storage compartment then up through an existing wire raceway to the wall behind the TV where there was room to mount a dedicated AC outlet. I had to cut a hole in the wall for the outlet and decide what kind of outlet to use—yes there are different kinds. Which one will work best may depend on the particulars of the mounting location. 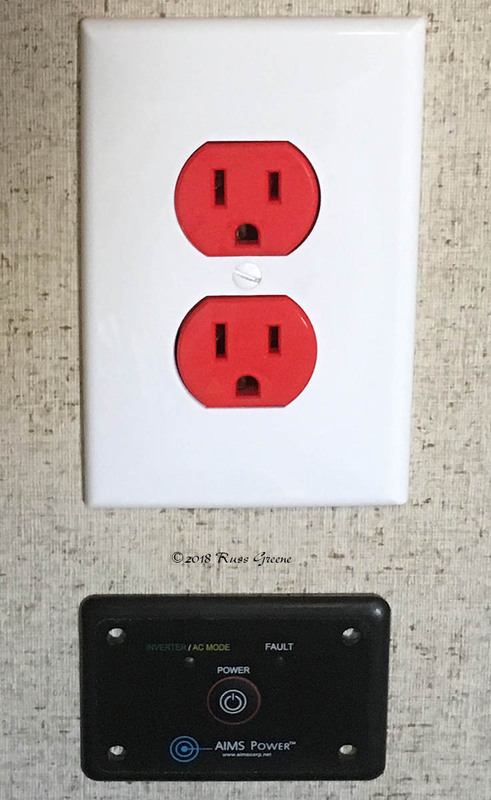 I decided on a standard household style outlet but red in color so it would stand apart from the brown outlets built into the RV. I also chose a shallow outlet box in which to mount it because there wasn’t enough space for a deeper box. The green routing-test wire has been fed down from the outlet behind the TV, through the wire raceway and into the compartment next to the pass-through storage area. This compartment was accessed by removing a plastic divider that separates the compartment from the storage area. At this point I new I could gets the wires run easily from the planned locations for the inverter and its dedicated outlet. Having determined I had a viable wire route from the inverter to the wall behind the TV I measured the outlet box I would use for mounting the 110 volt outlet, outlined the hole I would cut for it on the wall, drilled holes at the corners and used a keyhole saw to cut a hole for the outlet. There were wires back there but I didn’t cut any of them… phew. (I found my cell phone handy for seeing behind walls by placing the camera end into outlet holes and shooting stills and videos.) Perhaps here I should say that I had also purchased a remote on/off switch for the Aims and mounted it directly beneath the red AC outlet. This would allow us to turn the inverter on and off without having to go outside to open and close the front storage compartment which would be a real hassle. The mounting location of the remote switch right beneath the dedicated inverter outlet would make associating them and accessing them both at the same time most convenient. 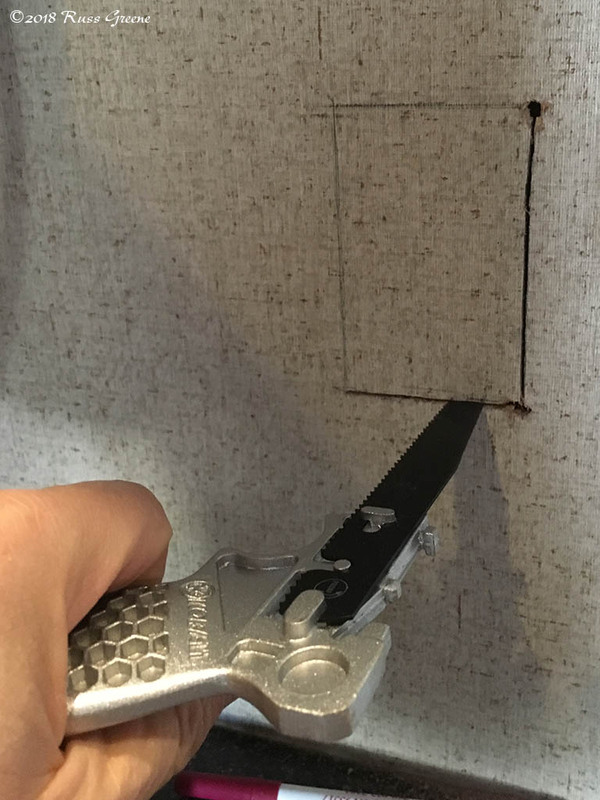 Having determined I had a viable wire route from the inverter to the wall behind the TV I measured the outlet box I would use for mounting the 110 volt outlet, outlined the hole I would cut in the wall, drilled holes at the corners and used a keyhole say to cut a hole for the outlet. There were wires back there but I didn’t cut any of them… phew. Next, I had to find a way to route the power supply cables from the batteries to the inverter. A steel wall separates the battery compartment from the front storage compartment in our RV but I discovered an opening between the two near the top that was covered with corrugated plastic—like a cardboard box but made of plastic. I was able to route the two 4 AWG battery cables through the plastic by doing a little cutting with a shears. Here, the passageway between the front storage compartment and battery compartment is shown. The corrugated plastic piece that normally closes this space is hanging down at an angle on the left. One of the batteries is visible through the hole. Other components of the installation included a Blue Sea On/Off switch so I could cut power to the inverter without having to disconnect wires and a Blue Sea fuse and fuse block to protect the circuit. This fuse block mounts directly on the battery so the task of drilling mounting holes and securing another kind of fuse block was obviated. 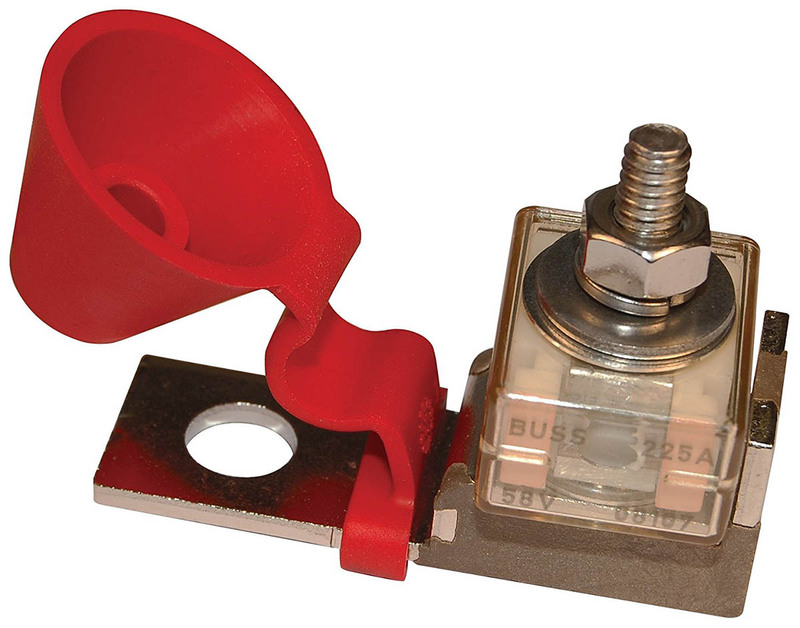 This Blue Sea MRBF Terminal Fuse Block mounts right on a battery terminal (providing your batteries have threaded terminals with nuts or bolts) and the fuse sits right on it. That cube below the nut is the fuse. This installation, while simple enough, was by no means easy and it took a great deal of time. It took time to find the spot to locate an inverter and one that would fit in that spot, plus one that could be mounted in the orientation I wanted. It took time to figure out the wire routings, how much and what kind of wires and battery cables to use; time to figure out what kind of electrical outlet to use and how to mount it, time to shop for the inverter, wires, cables, outlet box, p-clips to secure the wires, drill and cut the holes, make the connections… you get the picture. For me, DIY jobs like this have both advantages and disadvantages. The advantages may include the gain of knowledge and skills, cost savings, familiarity with components and installation which may come in handy if modifications or repairs are needed later on, and knowing that the job is done right along with the satisfaction of having done it yourself. The disadvantages may include the time it takes, having to buy and learning how to use new tools and potentially screwing up the job so as to partially or completely eliminate any cost savings, frustration, skinned knuckles and banged up heads. With my previous RV I hired an inverter installation done. It was costly and I had to redo much of it myself. Eventually, after explaining the problems of the installation to the installing RV facility and sending them photos of what they’d done wrong and how I fixed their blunders I was able to get a partial refund of several hundred dollars. Oh, and I had to fabricate a mount for the inverter because the installer didn’t want to! This DIY project worked out for me, but I’m glad to be done with it. We now have two inverters. The “little” Aims we can use when we need less juice than the “big” Magnum and when the dedicated outlet is convenient. 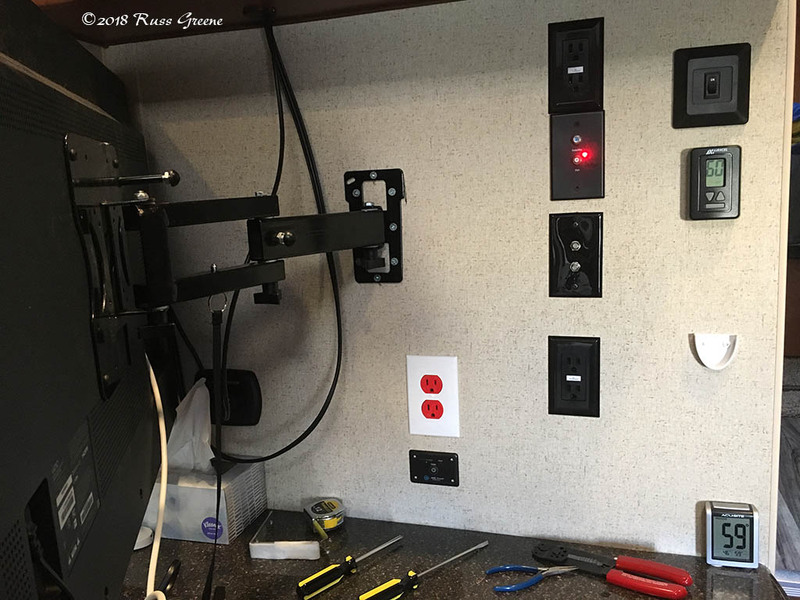 The red 110 volt outlet and the Aims remote on/off switch have been wired and installed. The red outlet and white plate surrounding it make the outlet easily distinguishable from the other outlets which are not supplied by the Aims inverter. The switch is visible when the TV is against the wall so its green LED is also visible. If we see the LED while not inverting its a clue that we should turn the inverter off.